What to expect from the week ahead in Asia? International week rolls back into town over the coming seven days with plenty to watch out for across Africa and Asia. World Cup qualification gears up to another level in Asia as we narrow down to the final 12 participants on the “Race to Russia”, while six nations contest the final three spots in Asian Cup qualification. Martin Lowe considers the key areas from across the continent to look out for. The dominating topic of the past year has been the emergence in power of Chinese football. The domestic league has prospered with an escalation in spending which has seen world stars (has-beens alongside up and coming ones) flock East, admittedly mainly due to cash, but also the allure of a growing fan base and increased marketability in the region. With such a spotlight comes added pressure on the national side, who’ve yet to really live up to the glitz being generated in the club game. Progression to this latest stage of World Cup qualification had all but been written off come the latter part of 2015, with incoming (initially-temporary) boss Gao Hongbo being brought in to bring back some respectability to the nation rather than to provide instant results. In the end a fortunate run of results saw them through to Round 3 of qualification via the lucky loser route, a progression that confirmed Gao in the hot seat for this stage at least. Now, back on a level starting block, pressure remains high despite expectation falling a notch lower after a drab Round 2. Whatever the draw, China knew they had a tough start, and so it materialised pitching them against South Korea (away on Thursday) and Iran (at home on Tuesday) in the first two game weeks. Straight into the fire then. China’s bluntness in front of goal has been their main weakness, recording two stalemates in Round 2 with Hong Kong, whilst failing to score away in Qatar, they only really impressed against the minnows in the group. In not exactly the most testing of home warmup friendlies against Trinidad & Tobago (a 4-2 victory) and Kazakhstan (a 1-0 loss), there remains little to cheer, that is apart from the odd ray of sunshine. 19-year-old striker Zhang Yuning scored a brace on what was his NT debut against T&T and is already causing waves of hype back home, given he’s the only current international playing his football in Europe, with Dutch side Vitesse. Alongside the fledgling starlet comes Jaing Ning, a player at the other end of his career but forging a return under Gao. 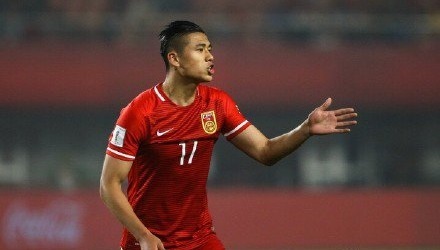 In his first squad call up in nearly three years, Jiang notched a hat-trick against Maldives in March’s WCQ before scoring again in China’s June friendlies. Hardly prolific domestically, Gao will hope he can bank on Jiang to keep his goal scoring touch going for the national team. This goes back to China’s biggest headache, when it comes to developing strikers. With such a limited field to choose from, lessened now given the explosion of talent being imported domestically in attack, the national team have often relied on spurts to get them through. The previously firing Yu Dabao and Yang Xu, who both featured in our SFG Top 100 series after brilliant 2015 runs, have dried up predictably this year. The only way out of this need to grasp onto any sign of notable form could be through Zhang Yuning’s emergence. Can he live up to the pressure? Initial signs are promising. Can anyone break the top four? We’re two years down the line from World Cup 2014, and unsurprisingly we’re tipping the same four of Australia, Iran, Japan and South Korea to come out on top and qualify for the next edition in Russia. But is there a credible challenger out there that can break through in this qualification stage? Qatar were the most impressive performers in Round 2 and can also count on some impressive friendly preparation in the last month, which the larger nations can’t rely upon. Victories over Iraq, Jordan and Thailand shouldn’t be sniffed at, even if they were unofficial meetings, while the re-introduction of now-Sporting Gijon based Akram Afif will add another dimension to their attacking play. The added form of QSL champions’ Al-Rayyan’s strikers Sebastian Soria and recently nationalised Rodrigo Tabata also goes someway to provide a credible goal threat. With Iran and Uzbekistan in their first two, some shocks could be on the cards. The other side to consider are Saudi Arabia, who under Bert van Marwijk are slowly upping the gears and have been pretty handily placed by the Round 3 draw. Their first matches on paper look more than appealing; Thailand at home followed by Iraq in Malaysia represents two opportunities that could see Saudi top the group early on. With rivals for progression Australia, Japan and UAE all set to face one another over the next week, many could be speaking a lot more about the Green Falcons come the end of the period. Iran remain technically on top of Asia (via the disputed FIFA rankings) with recent friendly victories to supplement their comfortable progression through Round 2 of qualification. While off the field worries over the future of Carlos Queiroz have quietened for now, the interest is well and truly back on the pitch with goal scoring sensation Sardar Azmoun. The young striker, who came of age at last year’s Asian Cup, has continued in devastating fashion with Iran scoring a hat-trick against Macedonia in June before adding another days later against Kyrgyzstan, but it’s his emergence in Europe that is generating the most attention. Scoring in back-to-back ties over Anderlecht and Ajax, Azmoun fired his club side Rostov through to the UEFA Champions League group stage, a first for the Russian club who permanently signed Azmoun this summer. Thought to have been monitored by fellow Champions League clubs in recent matches, the coming week looks another enticing opportunity for Azmoun to impress once more. Iran themselves will be thankful they have Azmoun in the squad, with Qatar and China ahead this international break. It remains to be seen if Team Melli can live up to their tag of top dogs in Asia. Away from the main event which is World Cup qualification, there’s still the matter of finalising Round 3 of Asian Cup qualification in UAE 2019. The final round of playoffs which start on Tuesday represents some side’s third and final chances to pass through, but at the very least can be seen as yet further worthwhile competitively organised football for some of Asia’s weakest national sides. Bangladesh start favourites against Round 2 whipping boys Bhutan, while an under pressure Maldives side now under new management with Australian Darren Stewart stepping in for the fired Ricki Herbert, face lowly Laos. East Timor and Taiwan will play both legs of their tie in October, due to hosting complications.